Bharat Sanchar Nigam Ltd (BSNL) today launched new revolutionary plan ‘BSNL Harsha Prepaid’ for its CDMA Mobile customers in Karnataka circle which offers Local and STD calls to any BSNL number across India just 1 paisa / 2 seconds. The plan also include affordable Local & STD calls to other network, lowest National Roaming calls, SMS and high speed EVDO Data usage charges. 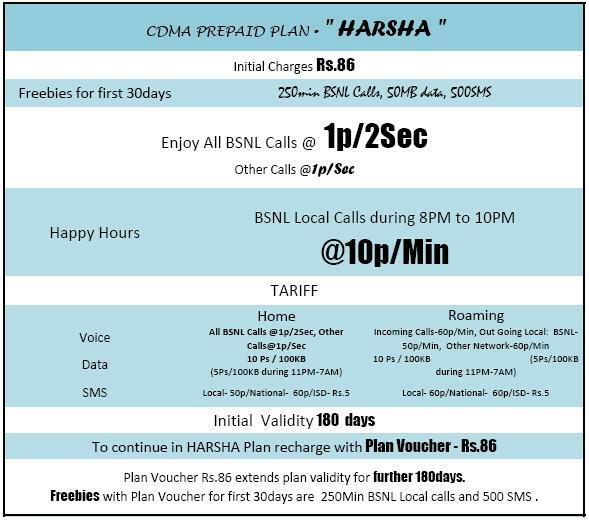 BSNL Karnataka’s ‘HARSHA Prepaid‘ Plan comes for Rs.86 for new CDMA prepaid customers offering freebies of 250 Min Local BSNL Calls, 500 Local and National SMS, 50 MB EVDO Data (3.1 Mbps) usage free for 30 days from the date of recharge. 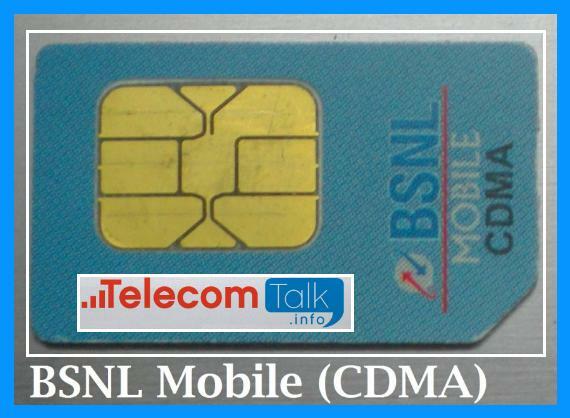 With this CDMA Prepaid Pack, customers can enjoy local and STD calls to BSNL number across India 1p/2 Seconds, Calls to other network will be 1p/Sec. Customer also can make local calls to BSNL numbers just at 10p/Min during Happy Hours – 8PM to 10PM. National Roaming call charges will be Incoming 60paise/min, Outgoing Local BSNL 50 paise/min, Offnet 60paise/min. Traiff will be valid for 6 months from the date of first Recharge. After 6 months customer can continue with this plan by recharging with Plan continuation voucher of Rs.86. The Plan validity extended to further 180 days from the date of recharge. technically cdma have much more advantage over gsm. few points are lesser frequency consumption, lesser no of tower req for network expansion means less health hazard, higher data speed, large coverage, low power consumption etc.. such step bsnl should have taken very early. right step by bsnl. Verizon USA will exit 2g 3g by 2021 ! not a big deal as cdma tech is developing day by day. by 2021 cdma will have a new face same bsnl or cdma operators in india will adopt it..let see..
most of the CDMA service providers are surrendering spectrum beyond 2.5MHz and concentrating only on data services. Verizon USA (the most popular) has made exit plan from its 2G & 3G CDMA services by 2021!! Now here our BSNL is slowly circle by circle offering voice plans on CDMA. BUT WHYY?!!! !